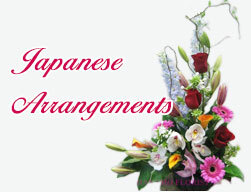 JAPA900 Japanese arrangement large with a fan ML [JAPA900] - $150.00 : Hanamo Florist Online Store, Vancouver, BC, Canada, Quality arrangements using a plethora of the freshest flowers. < 3 business days notice required > Perfect for celebration occasions. Flowers are an assortment of seasonal flowers and some tropicals may be used due to the market avaiability. Picture shows the medium large size, also available at $200.00 Large size.